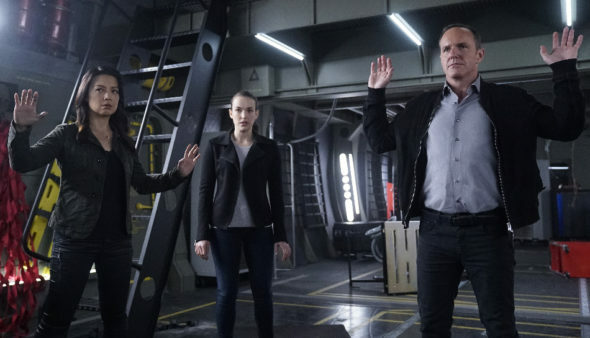 Is Marvel’s Agents of SHIELD coming to an end? Recently, co-showrunners Maurisa Tancharoen and Jed Whedon spoke with TVLine about the future of the ABC TV show. Part of the Marvel Comics universe, the drama centers on Agent Phil Coulson (Clark Gregg) and his team as they investigate the new, the strange, and the unknown across the globe, protecting the ordinary from the extraordinary. The cast also includes Ming-Na Wen, Brett Dalton, Chloe Bennet, Iain De Caestecker, and Elizabeth Henstridge. Season five of Marvel’s Agents of SHIELD returns this Friday, March 2nd, at 9 p.m. ET/PT. What do you think? Are you a fan of Marvel’s Agents of SHIELD? Do you want a sixth season? Marvel’s Agents of SHIELD: Will Season Five Air in Fall 2017? I truly hope it gets renewed. This is the only show that can correspond with the movies and hold true to the storylines. Give it one more season to see if the ratings go up. I love the show but all good things come to an end. So few well written sci-fi on TV. Hope it can keep going but the executives will make that decision. Look how TIMELESS was picked up by another network just through fans letter writing. Keep it! We all need some well written fantasy. Love how these characters interact with the big screen. A new Marvel series? Have SHIELD characters interact with them in same week’s episodes to keep interest up on both! The CW does it quite well. So many good shows are being cancelled. I hope Marvel’s Agents of SHIELD isn’t one of them and is renewed for Season 6! Big fan, will be really upset if it’s canceled.